A renewed call to end the cruel hunting of whales has been triggered off. It followed the worldwide public attention which was drawn to the protected bottlenose whale and the sad events which took place in the Thames, London, during weekend. The World Society for the Protection of Animals (WSPA), which coordinates Whalewatch, a global coalition of over 140 animal welfare associations in more than 55 countries, amongst which is also Animal Friends, is keen to highlight the dangers facing thousands of the planet's whales. In spite of all the best efforts of the animal welfare activists on hand, bottlenose whale, which was stuck in Thames river on Saturday, perished because of stress and wounds he got in shallow river. 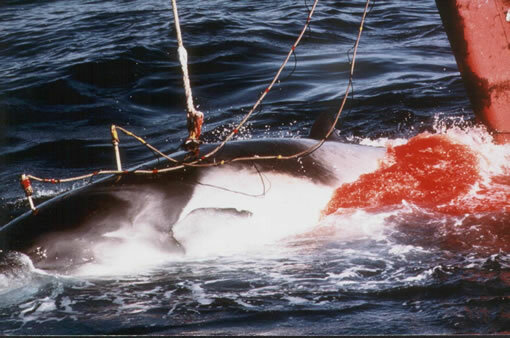 This event brought attention of the public to a globally important issue - all over the world more than 2,000 whales are killed every year through "scientific" and commercial whaling conducted by Norway, Iceland and Japan. In 1946, Dr Harry Lillie, a ship's physician aboard an Antarctic whaling ship likened the killing of a whale to, "a horse having two or three explosive spears stuck into its stomach and being made to pull a butcher's truck through the streets of London while it pours blood in the gutter..." He said that "The gunners themselves admit that if whales could scream the industry would stop, for nobody would be able to stand it." Whalewatch has been campaigning for three years, lobbying national and international governments to put an end to this unnecessary and inhumane practice. It is important for the public who followed the attempted rescue of the Thames whale at the weekend to know that they too can help us save whales across the world by taking action, writing to their MPs and asking their governments to join IWC (International Whaling Commission). Animal Friends will once again send a letter to the President and the Government of Croatia asking for urgent adjoining of Croatia to IWC. This proposal is supported by Ministry of Culture and its Department for Protection of Biological and Natural Diversity. Joining to IWC would enable Croatia more active contribution to protection of whales which know no national boundaries and therefore every country should take part in protection of those animals. We call all citizens to support our strive for urgent joining to IWC and to become aware that no matter where we live, every one of us, with our diet and general lifestyle, makes impact on world oceans and seas and all their inhabitants.